There are dates you don't ever want to forget…and now you won't. The Eternal Love Bracelet commemorates a couple's favorite day, the day a child or grandchild was born or any day that has meaning. A simple bronze heart floats around the bracelet for an added touch of style. The price listed is for a single bangle with a small bronze heart. 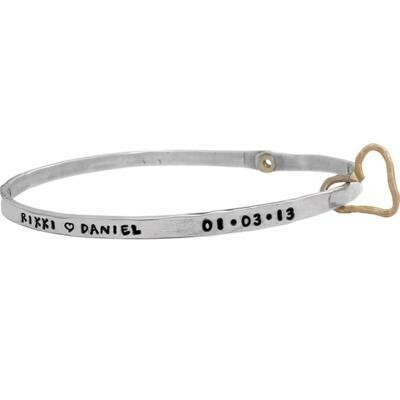 The bangle will be stamped with a name/word and a date - or you can choose to have two names/words per bangle. Each stamp has a maximum of 12 characters/spaces. Stamp the date of your first date, your first kiss, your engagement date or your wedding date. Add on your names or a word that is meaningful to you. Or stamp your child's or grandchild's name and the day they were born.The stamps will be seperated with about an inch to an inch and a half of space. Because these bracelets are customized, all sales are final.